I think fall has officially edged out spring as my favorite season — it was a close race between the two. What’s been especially nice is that I’ve been able to actually enjoy the beautiful fall weather we’ve been having lately. I’ve got to say, this new job has been one of the best changes I’ve made — I actually have a life now! 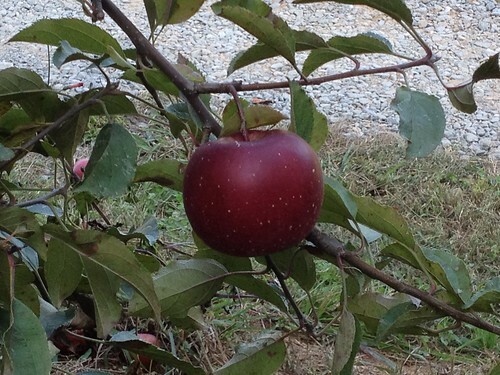 For instance, yesterday some friends and I went up to Ellijay, Georgia to go to an apple farm for some fall fun. It was a day-long event, beginning with brunch, then the drive up to the foothills of the mountains, a tractor ride around the apple farm, apple picking, then dinner and a movie (we saw Sinister — very scary and I had a hard time sleeping last night!). It was a fantastic day out! I have no idea what kind apple this is, but doesn’t it look beautiful? Red and juicy, ready to be plucked! 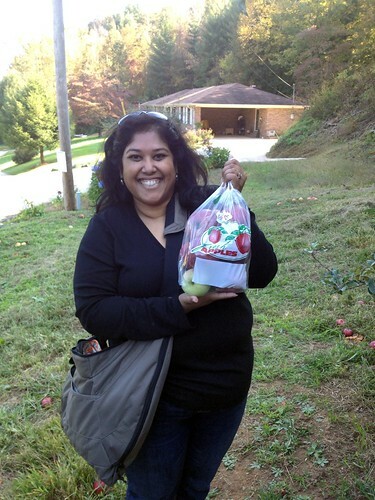 Me looking way too excited about the apples I just finished picking. The farm we went to was Red Apple Barn. 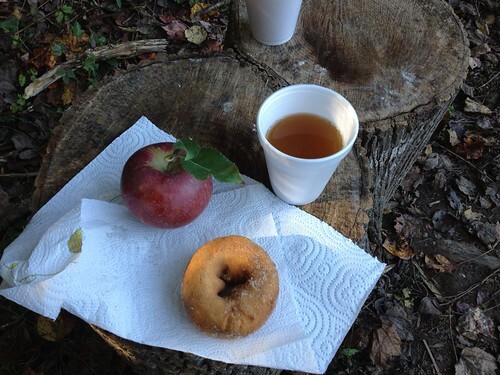 For $5 you get to go on a tractor ride tour of the farm, pick an apple and then an apple cider doughnut and some apple cider to wash it down. 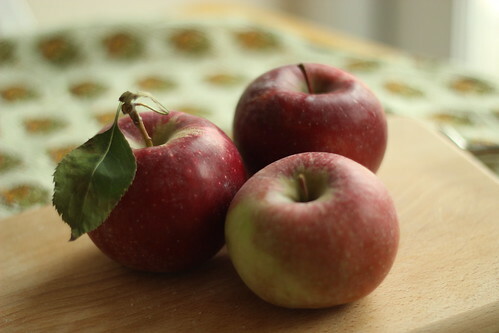 For another $6, you can pick a 1/2 peck of apples. Not a bad deal at all! 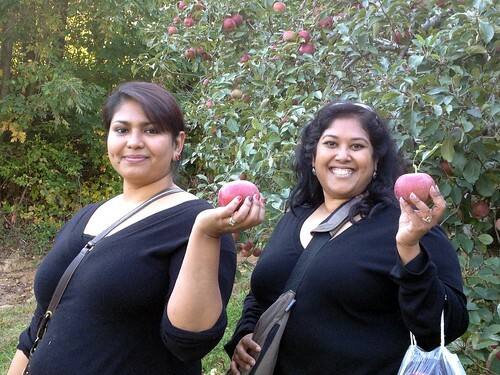 A couple of us decided to be silly and pose for “desi-style” Desperate Housewives pics! Yes, I totally posed my doughnut and cider. And used one of my apples as a prop. Don’t worry, my friends made fun of me! As we were leaving the apple farm, we made sure to stop at the store to pick up apple goodies — I got some more doughnuts, a loaf of apple bread, an apple fritter, some Dutch apple preserves and a cookbook from the area. My friend Lopa’s car smelled good with all our apples and baked goods riding back with us! 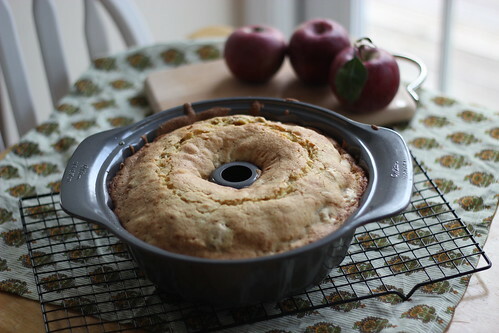 Today, I decided that there was no way I was going to be able to eat all those apples before we leave for our vacation at the end of the week, so I flipped through the cookbook and found a recipe for Apple Swirl Cake to use some of them up that looked easy enough — you know me and baking! Apparently this is a popular recipe, because I’ve found the exact same one on quite a few recipe sites and blogs. After tasting the finished product, I can see why it’s so popular! It’s really pretty easy. I think the hardest part for me was peeling the apples. 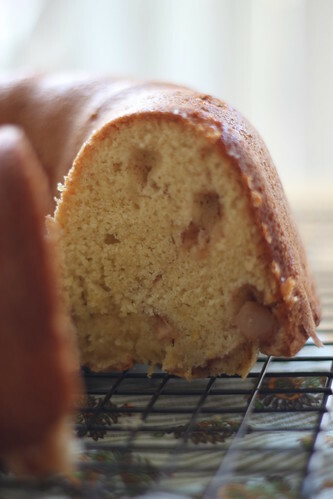 Once the apple mixture is done, the rest of the batter comes together quickly. Okay, maybe the next hardest part was waiting for the cake the cool! Preheat oven to 325 degrees Fahrenheit. 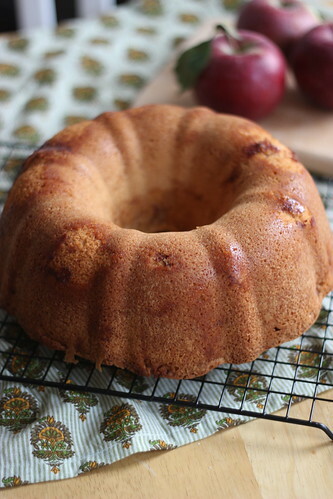 Spray a 12-cup Bundt cake pan with cooking spray and set aside. 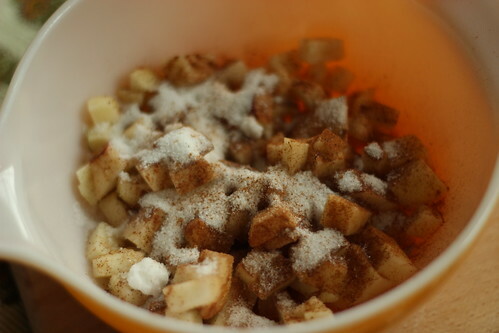 Combine the chopped apples with the 3 tbsp. sugar and spices in a bowl. In a larger bowl, beat the 2 cups sugar together with the canola oil — the mixture will look gritty. Add the eggs, vanilla, and juice. Slowly add the remaining dry ingredients. Beat until the batter is smooth. Pour about a third of the batter into the Bundt pan. 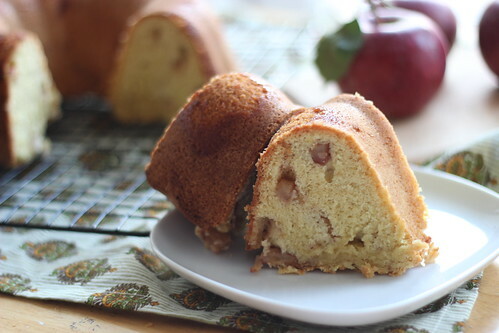 Sprinkle half the apple mixture on top, then repeat the batter and apple layers one more time. Pour remaining batter on top. Bake for about one hour, until the cake is done. Cool the cake in the pan for about 15 minutes, then turn upside down over a wire rack and remove pan. 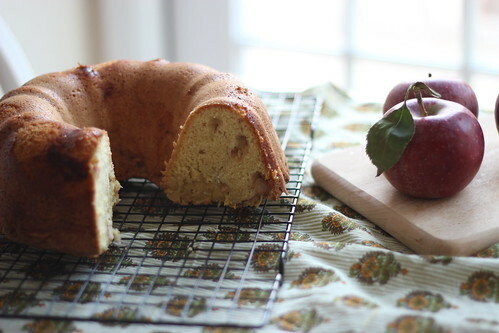 That is a scrumptuous cake, I am absolutely going to make it, thanks for the post!! So glad you enjoyed your visit to our farm!! Loved the pictures! We hope you can come again.